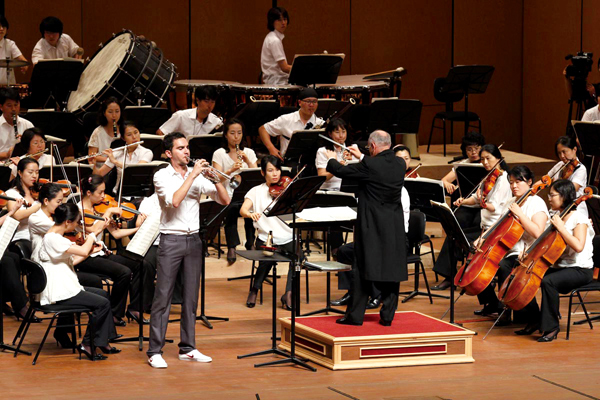 The 15th Jeju International Wind Ensemble Festival finished its nine-day musical journey on Aug. 20 in Jeju City. Attracting an estimated 46,000 audience members from Korea and abroad, the JIWEF, received many positive reviews. “It’s a perfect festival for this hot summer. I came out to enjoy the 8 p.m. concert at Jeju Seaside Art Center every night,” said Bae Ji Won, a college junior from Top-dong. The festivities began on Aug. 15 at the Jeju Art and Culture Center with a street parade of the musicians, which concluded at the Jeju Seaside Arts Center where the welcoming concert, Viva Brass! took to the stage at 7:30 p.m. and lasted several hours. All the seats were filled and people seemed to enjoy the summer night music. The concert was not all about classical music. The Chestnut Brass Company, Sound INN Brass, Jeju Wind Orchestra and Jeju Special Self-Governing Province Jeju Chorale and Seogwipo Chorus, gave very audience-friendly performances to which audiences could follow along. For the 6th Jeju International Brass Competition section of the festival, 276 musicians from 19 countries competed. There were more participants this year due to the fact that the competition became one of the World Federation of International Music Competitions on April of last year. For the competition, if judges deemed that no performance warranted first place, then no first place would be given, and ranking would begin at second place (if the judges decide that a performance was worth second place). As an example Janos Benyus from Hungary won second place in horn, without there being a first place winner. There were no second place winners for bass trombone. The festival could not have been such a success without the help of the 120 volunteers who were willing to assist audience members and the committee. “If there are any problems, the people have been so friendly here that they fix it as soon as possible and they have been really open to our suggestions. It is such a welcoming island. It has really been a great experience,” Battista said. The festival will return next year, Aug. 12 through Aug. 20. The International Brass Competition section of the main festival will return the following year, 2012. For more information visit www.jiwef.org.